Your dog’s nutrition is probably one of the most important factors that you need to keep in mind regarding their health. Did you know that many common health concerns for canines can actually be avoided or corrected by feeding your dog the right type of food? The key is to understand that not all dogs require the exact same things when it comes to their nutrients. Feeding your dog high quality, premium dog food that is specifically formulated for their breed is a great way to ensure that you give them everything that they need. So, what is the best dog food for labs? Unfortunately, there are really only a couple of breed specific formulas on the market, which is why you really need to learn more about what to look for in their food. This will make it easier for you to decipher between your options. Let’s start by learning more about the nutritional needs of Labradors. Since labs are considered highly energetic large breed dogs, it would be common sense that they would have a pretty big appetite. Labs gain weight very quickly, especially if they eat too much. This is why it is necessary to not overfeed your dog. A good way to ensure proper calorie consumption and adequate nutrients on a daily basis is by measuring out their food. It is always best to get a nutrient dense food, because it will keep your dog from feeling like he is hungry later on in the day. This promotes a healthy weight, and prevents obesity– which is oh so common in Labradors. First, you need to make sure that the foods that you choose have an adequate amount of protein. Protein is really important for active dogs like the lab. A quarter of their overall diet should be made up of protein-based ingredients. For optimal amounts of protein, make sure that the first ingredient is a meat or fish source. Some people ask if there is much of a difference between the meat meal and the real meat. They are both adequate protein sources, but the real meat will definitely have a higher water content. As for which is best, there are pros and cons to both. Active labs really need good carbohydrates in their food as well. As they burn energy, their body will look for the carbohydrates first and foremost. The key is to choose complex carbohydrates, rather than simple carbohydrates. Plant based carbs are always best, but you should avoid foods that have a high amount of corn. This can be counter-productive when it comes to healthy digestion. Lastly, you will want to look for fat content in the food. While you don’t want to feed your dog too much fat, fat is really important when it comes to vitamins A, D, E & K absorption. The key is to make sure that your dog’s diet doesn’t contain too much fat. A general rule of thumb is to look for a food that doesn’t contain more than 5% of fats. Also, look for the foods that contain healthy fats, instead of unhealthy, saturated fats. This is one of the questions that we get asked most often when it comes to foods for Labradors. So, what is the best option? The truth is, it is important to give your dog dry food on a regular basis. The kibble is designed to help promote healthy teeth and gums, which is extremely important for the lab breed. That doesn’t mean that you can’t supplement with canned food every once in a while. Canned food is a great supplement to dry kibble, when used as a treat every now and then. Just don’t underestimate the importance of a regular diet of dry kibble. Now that we have taken a look at what your labs diet needs to include, it is now time to review of few of our top picks! 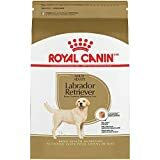 First, let’s take a look at Royal Canin Labrador Retriever Dry Dog Food. This is a popular choice, because it is specifically designed for Labrador retrievers. This formula is designed for dogs that are at least 15 months old, but there are puppy formulas available as well. It will not only help to support healthy joint function in your pet, but it will also improve their mobility and give them a healthy skin and coat. Most people go ahead and order it in a 30 pound bag, because it gives you a better deal, and will last you longer. Remember, labs have a tendency to eat more than smaller breeds because of their nutritional requirements. With this food, you will be promoting an ideal weight- and the kibble is a perfect size for the Labrador as well. 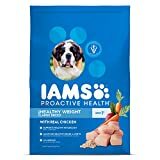 Just because Iams Proactive Health Large Breed formula doesn’t specify that it is for labs only, it is a great formula for large breed dogs. Iams is actually one of the most recognized names when it comes to premium dog foods. This particular recipe is designed for dogs that are over a year old, but this one also has puppy formulas available that will give your dog the nutrition he needs during his first year. The Iams Proactive Health formula helps your pup to stay healthy and active by promoting joint health. It offers chicken and egg based protein, which helps to build lean muscle. If you take a look at the ingredients list, you will find that chicken is the top ingredient, and it is also packed full of antioxidants, vitamins and minerals that are sure to boost your pet’s health and immunity. Pedigree is another name that most people recognize in the pet food industry. They have a variety of different foods for dogs, including the Pedigree Large Breed formula – which is ideal for Labradors. It is made with twice as much rice and chicken protein, to help aid in digestion. It also has essential nutrients that help to boost bone health and joint function. Among the ingredients, you will find glucosamine and lots of antioxidants. The kibble is designed to provide excellent dental health for your dog as well, and it has a larger kibble that will ensure that your dog chews the kibble rather than swallowing small pieces whole. Labs have a tendency to try to eat fast, so kibble size is important. Did you also know that the large kibble size also aids in healthy digestion? These are just a few reasons to choose this brand. Nutro Max Large Breed Adult Dog Food, Natural Chicken Meal And Rice 30 Lbs. 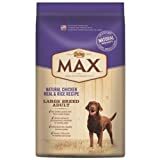 Max Dog Large Breed Adult Dog Food is made by the Nutro Company, which has been in the dog food industry since 1926. It is made with real chicken protein, whole grain wheat, and rice – which aids in healthy digestion and offers optimal nutrition. In the ingredients, you will find antioxidants that promote healthy immunity, omega 6 fatty acids that promote healthy skin and coat, and natural sources of chondroitin and glucosamine that boost joint health and function. Unlike many of the other products on the market, this one doesn’t contain any chicken byproduct meal or any artificial colors, flavors or preservatives. It is fortified with natural ingredients to provide optimal health and wellness for your large breed dog. 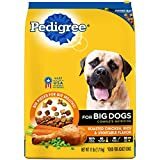 It comes in bag sizes up to 30 pounds for your convenience, and is priced competitively when compared to other premium dog food brands. If you are looking for a natural formula, then Castor & Pollux Natural Ultramix may be the right choice for you. It is ideal for active dogs, and is even great for seniors. It is made with natural chicken as it’s number one ingredient, and it offers fruits and veggies for added vitamins, fiber and antioxidants. If you look into the ingredients, you will find that it contains Omega 3 and 6 fatty acids, which boost skin and coat health. It also contains phosphorus and calcium for healthy teeth and bones. What you won’t find in this formula is artificial colors and preservatives, corn, wheat, or soy. It is made in the USA, and offers your pet 100% complete and balanced nutrition from adulthood into the senior years. If your dog has a sensitive stomach, then you may need to keep them on a grain-free formula. There are many to choose from, but one of our favorites is the Blue Buffalo Large Breed Freedom Grain Free Formula. It is designed for large breed dogs, like the lab, and it offers them the nutrients that they need on a daily basis. It contains high quality proteins and carbs that will give them the energy they need to stay active, without any grains or glutens that may cause an upset stomach. They offer both chicken and lamb varieties, so you are sure to find a flavor that your dog will enjoy. Also in the ingredients you will find blueberries, cranberries, sweet potatoes, peas, carrots and other healthy fruits and veggies. These offer your dog with the antioxidants, vitamins and minerals that they need. 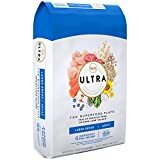 Made up of lean animal proteins, whole brown rice, flaxseed, rolled oats and natural sunflower oil, Ultra Dog Large Breed Adult Dog Formula is an excellent choice for your lab. It gives them radiant skin, a shiny coat, and strong, lean muscles. Blueberries, cranberries and pomegranate offers valuable antioxidants in your dog’s diet, and the spinach, carrots and tomatoes work alongside these antioxidants to provide optimal immunity. Nutrient rich superfoods help to promote heart health, and natural sources of chondroitin and glucosamine help to improve joint health. This is important for labs, because they are so very active. This puts a lot of stress on their joints. It is easy to see why lab owners are so focused on nutritional value of the foods that they feed their pet. In terms of nutrition, Ultra Dog has a whole lot to offer- and is made up of nature’s very best ingredients. Bil-Jac offers a wide range of great foods for dogs. The Bil-Jac Large Breed Select formula contains 12 pounds of fresh chicken in every 15 pound bag of their food. That means that it is packed with good protein that will give your dog the energy that they need to be active. It is also fortified with glucosamine and chondroitin to give your dog’s joints the strength that they need. The formula is carefully selected and formulated to ensure that large breed dogs get the nutrition that they need. Simply determine your pet’s weight, and feed them accordingly. It doesn’t contain fillers, gluten, wheat or soy unlike many of the other ‘cheaper’ brands on the market, meaning that your pet gets more nutrition out of each and every bite. It comes in varied bag sizes, each of them with chicken as a primary ingredient. Fromm Adult Gold Large Breed formula is naturally formulated with chicken, lamb, duck, whole eggs and real cheese. It is also enhanced with probiotics that help to ensure healthy digestion, and salmon oil that promotes a healthy, shiny coat. The protein found in this formula is made up of fresh, boneless, high quality meat that has been hand picked, trimmed and prepared carefully. Their food is prepared in small quantities to ensure the quality of each and every batch. Produce used in their food is always fresh, never pre-processed or dried. This is because fresh fruits and veggies offer the best absorption of essential vitamins and minerals. What you won’t find in this formula is wheat, because it can lead to stomach sensitivity in dogs- especially labs. If a premium quality food is what you are looking for, Fromm is an excellent choice. Last, but certainly not least, we have Orijen Adult Dry Dog Food. This is a formula that is 100% complete and balanced for all life stages and all breeds, and is suitable for labs. It is made up of fresh fruits and veggies, and fresh meat. Among the protein sources, you will find free range turkey and chicken, eggs, and wild caught fish. This makes up 80% of the food. The other 20% is made up of regional botanicals, veggies and fruits, including marigold flowers, juniper berries and kelp. Fresh greens offer vital phytonutrients, including B-vitamins and other trace minerals. There are no grains in this formula, and the carbohydrates are limited, giving your pup the diet that nature intended for him to have. If you are looking for a carnivorous diet for your dog, then this is definitely the one to go with.